PROMT Translation Server 11 won the 2016 IT Innovation Award in the Office Management category. 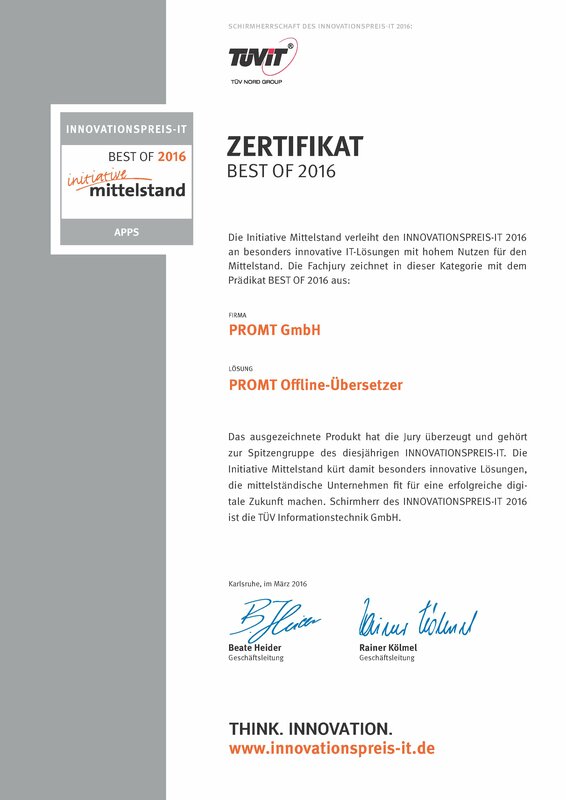 PROMT Offline Übersetzer won the 2016 IT Innovation Award in the Applications category. The jury made special mention of PROMT Offline Übersetzer as one of the most innovative mobile applications of the year with a high practical value for business. PROMT Professional received the “Excellent” rating from Software Informer Editor’s Pick. The test laboratory of PC Magazine/Russian Edition marks PROMT IT and telecommunications as the product which received the highest score of experts at laboratory tests. PROMT SMB was named the best by PC Magazine/Russian Edition. The first place for translation from English into German. Leading positions (2nd -3rd places) for translations from English into Spanish and from German into English. "This system is undoubtedly one of the best Russian software developments, and it should be noted". "Clearly structured interface allows easy usage of all important functions". "In "The Hitchhiker's Guide to the Galaxy" by Douglas Adams a little fish helps to understand interlacing of languages, and in real life it is necessary to know the corresponding language for this purpose, or to have PROMT Office Giant. The program translates any text into English, French, Spanish and Russian". "Accurately structured texts are translated perfectly. When translating complex texts the program serves for fast text understanding, and with editing of user dictionaries the translation quality permanently grows". "PROMT is the best choice for an office". PROMT automated translation technology has been awarded "The Best New Technology" prize by IDC Financial Insights as the next best application for the financial sector. @promt Professional 8.0 English <> French has become a winner in comparative tests by PC Expert magazine and received "Le choix de la la rédaction" ("Editor's Choice") award. @promt Professional 8.0 Multilingual received the highest marks in comparative tests by PC & I. It was named “the most complete solution” and the best in the “Quality” category. @promt Expert 8.0 Multilingual received "5 stars award" from Soft32Download.com and was named Premium Software. @promt Personal 8.0 received "TOP TEN REVIEWS Silver Award" in comparative tests for "clearer and more accurate translations than the competition"
@promt Personal 8 Multilingual Translator was named "Recommended product" by PC Today. PROMT 8.0 software received a BEST SOFT 2007 award in the "Desktop software" category in the "Russian software 2007" review. PROMT company is a winner in the "Russian Internet Awards 2007" in the "Russian Internet Intelligence" category. PC Magazine Test Lab noted that PROMT Professional 8.0 received the highest mark in lab tests. PROMT company is a winner in the CNews AWARDS 2007 "Russian technologies" category. PROMT 7.0 Professional Multilingual gets an honorable mention in the "Best products of 2006" category. PROMT Translation Server 7.0 Intranet Edition is the best server-side software according to the "Russian software: 2006 collection" survey. Online-version of PROMT translator is awarded best translation service in Internet. PROMT Quattro Personal 7.5 was named a winner in comparative tests by ComputerBild magazine. Our software products test showed @promt to be the best, due to its excellent translation technologies. Using @promt technologies, the program can understand sentences on a more granular level. @promt Office 2004 and PROMT Progress achieved the best results for translation quality in comparative tests by Computer Bild. Editor’s rating – 5 stars. @promt Office provides fast and high quality translation of text, e-mails and web pages. This translation program contains a powerful linguistic editor that enables fast and convenient editing of translated texts. The initial layout is preserved completely.